In 1989, the Cold War abruptly ended and it seemed as if the world was at last safe for democracy. But a spirit of uneasiness, discontent, and world-weariness soon arose and has persisted in Europe, in America, and elsewhere for two decades. To discern the meaning of this malaise we must investigate the nature of liberal democracy, says the author of this provocative book, and he undertakes to do so through a detailed investigation of the thinking of Montesquieu, Rousseau, and Tocqueville. 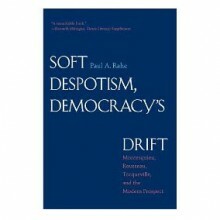 Paul A. Rahe argues that these political thinkers anticipated the modern liberal republics propensity to drift in the direction of “soft despotism”—a condition that arises within a democracy when paternalistic state power expands and gradually undermines the spirit of self-government. Such an eventuality, feared by Tocqueville in the nineteenth century, has now become a reality throughout the European Union, Canada, Australia, New Zealand, and the United States. So Rahe asserts, and he explains what must be done to reverse this unfortunate trend.